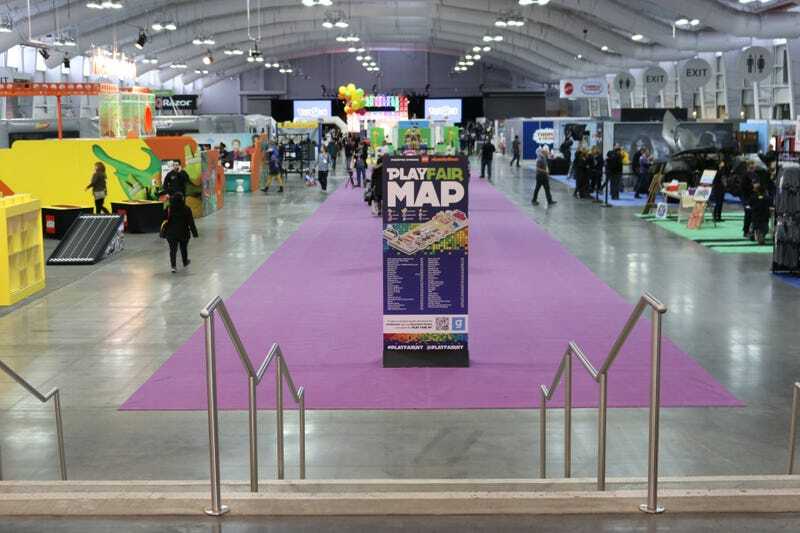 While most of New York’s Javits Convention Center is occupied by the the press, buyers and exhibitors of Toy Fair 2016, over in the North Hall they’re holding the first annual Play Fair. You know, for the kids. Open to the public today and tomorrow, Play Fair is an event that celebrates and encourages playing with toys. It’s also put together by the folks who make those toys, like Mattel, Hasbro, LEGO and Toys’R’Us. To a point it’s a big toy commercial, but it’s one that has a better chance of tiring out your children than watching a cartoon. Beware the leaderless roaming ninja turtles. There are characters to meet, bat-themed vehicles to take pictures of and plenty of fun activities for kids and parents to participate in.Scroll through the pictures below for a look at all the things parents and kids can do at Play Fair 2016. A bat-themed vehicle of some sort. Midtown Comics has a booth packed with toys and collectibles to buy. Like I need the temptation. Nickelodeon is the number one source of character costumes at the event. Do not taunt the Little Pony. DC Super Hero Girls are on display. Love Batgirl’s hoodie. It’s a Nerf arena. An inflatable Nerf arena. I need this. Piles of dead giraffe mascots littler the halls. Lions circle. Must buy Super Wings for my children. Toys’R’Us has something to say you guys. This would be a lot less humorous with kids there. This poor guy right here.